When you have great works like this anime title, I don’t think the people behind it have any reason to worry about piracy. Because after watching this, I went through a lot of trouble to locate one of it’s rare 1/8 PVC figurine. At first, a local blogger was selling this at $90 SGD (66USD). I made a bid for it. Another person decided to contest against me. We both continued out bidding each other for over a week. The person selling has a rule that if someone offers twice the amount of the original selling price, bidding will end and that person will win the bid. My rival offered $180. I lost the bid. This then fueled my desire to obtain it. I asked friends to help me keep and eye out and make forum posts to look for it. Even asked the local figurine sellers to help me look out for it. 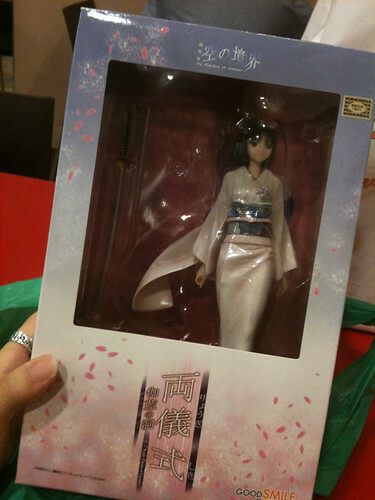 And one day, one of them found it in Japan and brought it back to Singapore. His price is $235 SGD (173USD) for it. After receiving news that he had brought it back, I went down to his shop immediately to buy it. Till now, I don’t feel a single ounce of regret spending so much on it. Each time I think about that day when I first held it with my hands, I can’t help but smile. That’s how much I love this series. I’ve even managed to find it’s Japanese novels at Kinokuniya and bought them as well. There’s still copies available at both Liang Court and Orchard stores if anyone’s interested. There’s a few 4-square comics on this series and I’ve bought a few of them. I’ve also bought the “Seventh Heaven” album by Kalafina featuring the songs that appeared in this movie series. In my upcoming trip to Japan in November, I will see if I can find the OSTs in the shops of Akihabara. And now, with news of it’s Bluray discs coming out next year, I’m prepared to say goodbye to another $800 SGD (626USD) just for it. And guess what caused all this spending spree? It’s been 5 months. I rushed and bought the PlayStation 3 Slim, Lightning Edition the day it was released. Because this is my first PS3 game, it has set very high standards for me. I’ve borrowed games like Virtua Fighter and Tekken 6 from friends and none of the 2 match up to FF13’s graphics. I got sort of turned off at the graphics I couldn’t find myself playing them any longer. A friend pointed out that it’s because the games are developed in 720p whereas FF13 is 1080p and this made sense. After completing the story for FF13, which I find satisfying (the storyline), I didn’t see the need to continue playing to complete all the missions and get all the trophies. 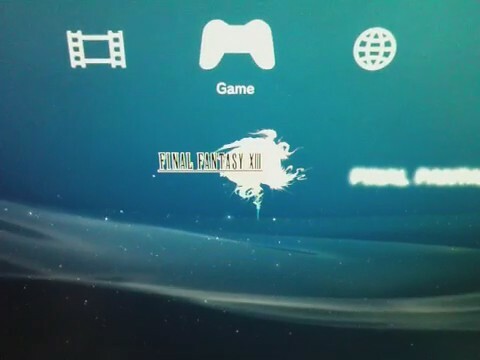 Then after a while, I decided to work on unlocking Lightning’s PS3 theme. Since my PS3 has a cool picture of Lightning on it, wouldn’t it be perfect to install the Lightning theme you get from unlocking a certain trophy in the game as well? So I began working on it. I started off by grinding for CP. And to do that, I would need the Growth Egg that doubles CP received. To get Growth Egg, I would have to fight Neochu. It’s a tough fight as it has 5-6 smaller underlings that attacks you very fast. I went through a few more difficult missions and it’s these difficult missions that got me hooked onto FF13 for the past few weeks. I love the whole system. I didn’t know until recently that having a SEN in your setup boosts the defence capabilities of your other 2 members and having 3 SEN makes it even better than 1. Same goes for the other jobs. There are times when you need to quickly switch to a 3 SEN setup to greatly reduce the damage from an enemy’s attack. Because of previous FF games, I had this impression that the summons would be useless in this game as well. 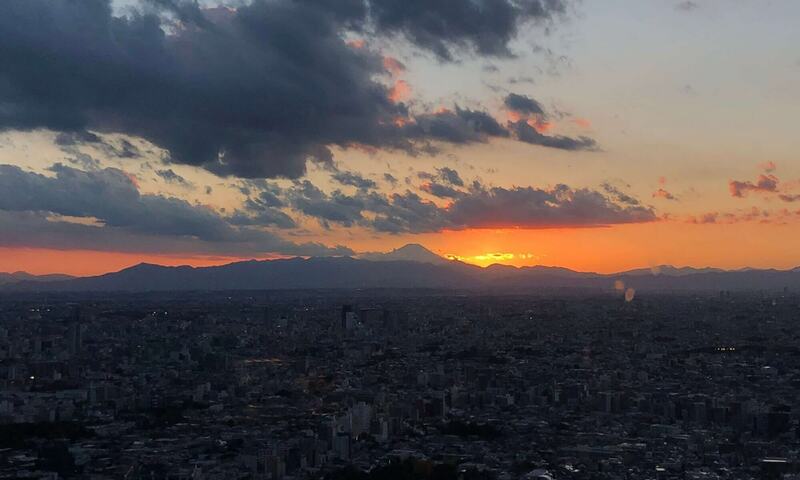 It turned out to be not too bad in 13. And to make each difficult hunt easier, you have a range of accessories and hidden abilities (hidden traits that you can unlock based on a combination of weapons and accessories) at your disposal. Also, each of the 6 characters have their own unique weapons, abilities and traits which you’ll need to consider when aiming for a 5-star win on a mission. Each time I failed a battle, I would go through my character and paradigm setup and equipment, upgrading when neccesary and keep trying until I won. This process is quite enjoyable and the feeling of achievement when you clear a difficult mission is there. As of now, I only have 3 more trophies (defeat long gui, obtain 5 star on all missions, obtain all items) left to acquire to totally “win” the game! After AFA09, K-on seiyuus, May’N and Danny Choo, each had their autographs up for auction. I’m not sure if you can call it an auction because you can only bid once, and you cannot find out what’s the current highest bid. But just for fun, I bid SGD$50 for K-on seiyuus’ autographs and SGD$20 (USD$14.20, JPY1308) for Danny Choo’s. I already have May’N’s. I bet if the organizers announced the current highest bid for those autographs, they could fetch higher prices for the autographs. 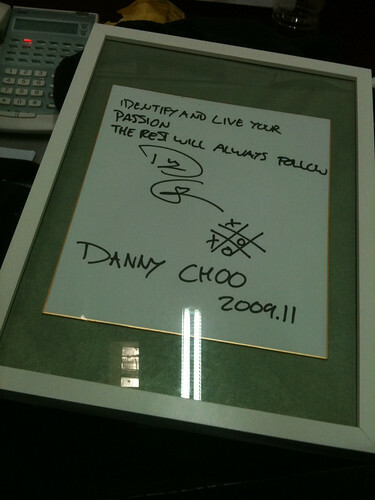 Because I actually won the bid for Danny Choo’s autograph, lol. But I’m going to assume there was a higher bid for it but that person didn’t show up to claim his prize. "Identify and live your passion. The rest will always follow"
Next on my shopping list is a PS3. I decided I will get one when they announced a slim version, but thanks to past experiences, I decided to wait till a special edition comes out. 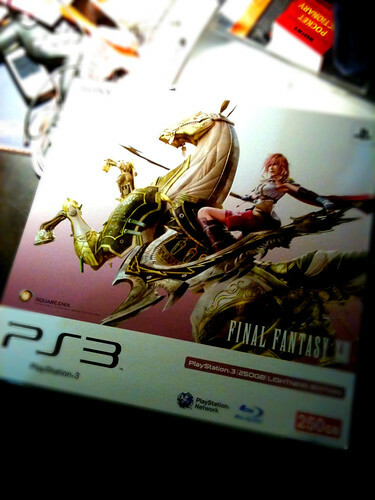 And I didn’t have to wait long until they announced a Lightning edition, which is the FF13 edition. Bought it from Gamescore. Thank god they offered to bundle a HDMI cable with it. I didn’t have one and it didn’t occur to me to get one. If not I would have to spend a torturous night staring at a PS3 slim but not being able to play it. Before I started playing the game, I went exploring the PS3’s home interface. God it’s beautiful. Those sparkly things kept me staring for a while.